It is very important to clean your gutters at least twice a year, if you do not have any gutter guard system. 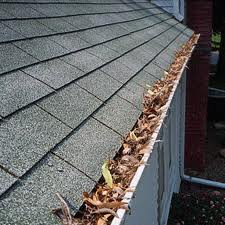 We actually suggest cleaning your gutters 3 times( spring, summer, and fall ) sometimes twice in the fall. Clogged gutters can cause water to back flow thru the fascia boards and create a mold problem. Also overflowing gutters can cause water to get into the basement or crawlspace. While its important to keep the gutters clean. Its also important to keep the downspouts away from the house so that they do not cause water to flow towards the house. 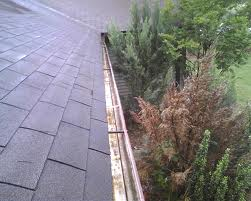 Below is an example of a gutter cleaning. Diamond Roof Cleaning is a recommended Gutter Brush installer. We have seen all the gutter guards out there ( We’re up on thousands of roofs per year ) and these are by far the best for the money. They are easy to maintain and actually do what they say they will do. They do not decrease the size of the gutter by covering the tops like other products. Gutter Brush will flow even if leaves get stuck on top. Which is very rare they will still allow water to flow thru and not cause a problem. See the example picture below.